Each October both commercial and charity haunted houses in Oklahoma open at Halloween to provide you with local scary entertainment. This year 2018 will again bring you some of the best haunted hayrides, haunted houses, haunted trails and more thrilling entertainment. Find all your local Halloween fun here at Funtober with our listing of haunted houses in Oklahoma. Expect to see vampires, witches, walking dead zombies, and monsters of all kinds roaming your local haunt. You can expects to scream at the Hollywood type design sets, live actors, air blasters, and horrific costumes. Do you run a haunted house in the United States? More than 500,000 people came to Funtober looking for a haunted attraction in October. Please see our advertising page or contact us for more information. Fright Fest opens for the season on September 29th. Frontier City is back with its spook-tacular event Fright Fest. It runs Friday, Saturday and Sunday nights in October. The park is open all day but at night from 6 pm to 11 pm Fright Fest brings out the ghouls and goblins. Purchase online in advance for additional discounts. During this year’s Fright Fest, the Frontier City gates will open to a petrifying post-apocalyptic world where guests will encounter terrors at every turn as soon as darkness falls. Radioactive mutants, zombies, and monsters emerge nightly for the Festival of Fright Parade at 6:30p before heading to their dead-end at one of the seven horrifying haunted attractions. Sorry folks but this farm is closed for 2018. They expect to return next year. Reding Farm has the largest corn maize in Oklahoma. They also operate a Haunted Maize and Haunted Hayride. Tickets include both the haunted maize and a haunted hayride experience. The hayride can be purchased separately. House of Thorn opens new on October 5th. This is the re-themed haunt. Same location again at the Washington County Fairgrounds Arena. All new characters this year. Tickets just $20. Attraction runs every Friday and Saturday nights in October. The attractions open for the season on October 5th. Tickets for an all access are $30. Individual attractions can be purchased separately. Doors open at 8 pm. Weekends the attraction closes at 11 pm or midnight. Attraction is located one mile west and one mile north of the Woodward Airport entrance. It takes about 30-45 minutes to walk through the half mile long trail attraction. It runs every Friday and Saturday nights from October 5th through November 3rd. Caution, please arrive early as they shut down exactly at closing time whether or not you have finished your walk. Haunt opens the season on October 5th. Psycho Path is open every Friday and Saturday night in October plus a couple Thursday nights. Suggest you try to avoid the dark spirited demon beasts. Tickets are $20 each for the Dark Ride, Shadow Box, or Cage Maze. A combo ticket includes is available. Doors open at 7 pm and close at 11 pm on Friday and Saturday or 10 pm on other nights. Expect to beg for mercy at this haunt that makes grown men cry. A 30,000 square foot attraction themed as a rehabilitation facility. It runs Friday and Saturday nights in October plus some additional dates. See web page for full details. Attraction opens on September 28th. 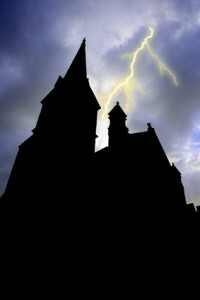 The Castle of Muskogee is a full entertainment haunt attraction. The Castle park is open for rides and entertainment. The Fright Haunted Castle is open 6 pm to 10 pm each Friday and Saturday in October. A $35 Fright combo pass gets you into the cemetery maze Casa Morte, haunted house Domas Horrificus, haunted woods Field of Blood, and the Ultimate Maze. You can start in the Halloween Village for free and also buy individual attraction tickets. Parking is Free. They have a range of family friendly mild haunts to absolutely terrifying attractions. Opens for the season on September 21st. “Tulsa’s most terrifying haunted attraction” features two haunt attractions. Go through the Adult Dark Ride or The Adult Shadow Box. Get both attraction with a combo pass. The Hex House is open from 7:30 pm to 11 pm. Attraction runs every Friday and Saturday night through October plus additional dates. See web page for details. Regular combo ticket is $25. A popular haunt with other 35000 Facebook likes. This popular attraction opens up on September 28th. The Sanctuary is Oklahoma’s newest and largest haunted house. The story is build around an institution following World War II. A German Doctor Hammond is hired who later imprisons the owner and conducts horrible Nazi like experiments on the patients. The attraction is much like a live horror movie. Being new, the owners of The Sanctuary use some of the latest Hollywood styled set designs and themes. Experience their state of the art special effects this year. Ticket are only $25. The show starts every Friday and Saturday night. Doors open at 8 pm and close at 12 am. Gates open at 7 pm. There are four haunt attractions. Trail of Fear is now in its 20th year of operation. Expect to be terrified. Tickets prices vary for The Experiment, Doll Creek, Cirque de Monte, or the Crispy Family Carnival. Get the All Park pass for savings. Trail of Fear is open Friday and Saturday nights in October starting on the 12th. New this year is the Halloween Midway. A carnival with games, paintball, inflatables, etc. Also Ghost Cart Racing, Pirate Ship Museum, Magic, Boo House Concessions, and Pumpkin Junction family fun area. Also they feature a Halloween festival on October 6th and 7th. Note information for the Lawton, and Luther Trail of Fear varies. Please check each individual web page for details. This Oklahoma City attraction is similar to their Lawton location. It is open Friday and Saturday nights in October. A general admission ticket for includes the Hackensaw Haunted Hill and Magic Guild. Ticket booth is open nightly from 6:30 pm until 10 pm. Gates open at 7 pm. Everything’s bigger in Texas. So if you live near the border, consider making a run to a haunted house to the south. Or, if you are unsatisfied with the selection of haunted houses near you, consider these other options. Did We Miss Something for 2018? Have you experienced one of these haunted houses? I would be interested in hearing what you thought. Did you have a good time? Was it worth the money? Would you recommend it to your friends? Any suggestions to maximize your experience? I’ll gladly publish what you send me and give you a super dooper hug. I’m the webmaster for Guthrie Haunts and noticed your link may be broken. Would you please update? We have a non-profit haunted house at the Disabled American Veterans in Muskogee. Cost is only $5 . Weatherford, OK – The Field of Screams (haunted corn maze) and the Freakshow: The Barn Gone Wrong ( haunted barn). The location is at P Bar Farms and only costs $20 a person to do both. Exscream Haunted House is also open. It is located just west of Ada on Hwy 19 in the old Pickett Center School. It is put on by Vanoss Public Schools. We also have a facebook page. What places do you have to sign a waiver to go in,Haunted Houses?